Thanks for pointing that out, I will check the other article. One more thing, I'm curious as to why "MSE" isn't included in that list? From my experience it's an excellent set-and-forget antivirus and correct me if I'm wrong but I believe it has been integrated in Windows 8 and higher. That's strange. Is it possible that it is detecting the language of the systems you are installing it to? What is the set language of the OS you are installing to? Also, if anyone else has experienced this same issue with Bitdefender Free please respond and let me know. Thanks. Not possible, all three computers I tested this issue on they are in English. I also just tested right now on my own laptop (running Windows 8.1 x64) and I'm having the exact same issue. Thank you very much for the digging. I was unaware of this problem. However, I have now added a link to the post you discovered to the article. 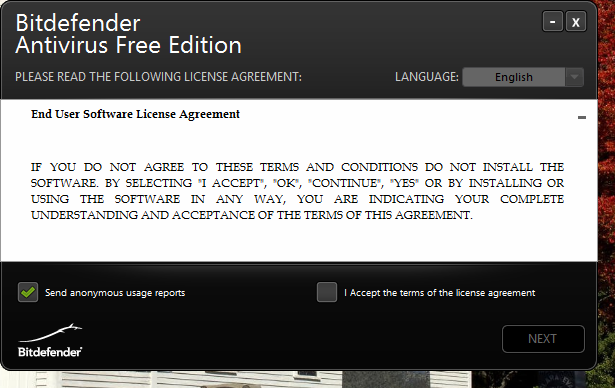 I'm sure this will help many others who otherwise would not have been able to use this quality software. Thanks again. I tried it today briefly but it was disappointing. During the initial scan it stated that it found and cleaned 16 infected files which is highly unlikley considering the semi-empty PC I was testing it on, but even when I opened its log, it was empty. Also, the fact it has no options to speak of leaves a lot to be desired. Indeed, I wanted to try it several times but was unable to due to that problem. In any case, I'm glad I could help. Real World Protection Tests at AV-Comparitives... Panda scores 100% at the expense of too many false positives (34). Good results for Qihoo, AVG(IS) and Avira(Pro). As MidnightCowboy said, at this time it is not a good fit for this article. However, I will keep an eye on it and see if it continues to improve, including testing by independent testing agencies. Thanks. An emotional Paste from DubSeven the developer, and the reactions Tiranium will be closed in a month. One great comment. "I saw how everything depends on money. The computer security is no longer about security but about money". You could pretty much extend the first part to everything on the planet. MC - Site Manager. I guess you meant 'planet'. I'm surprised that the developer is an 18 year old kid, and was 13 when he first coded Tiranium. Those insults must have hit hard on him. But he did some great work at such a young age. Indeed. The trolls enjoy their work however and must be really pleased with the result. Some might even suggest that one or more of the established names in the industry might have been involved. It's well known that some vendors employ legions of fanboys and trolls to post good and bad "reviews" online about competing products. Thanks for spotting my typo above which is now corrected. :) MC - Site Manager. Tiranium is an interesting project but is just a one man show with a small team of "helpers". We won't be featuring this here (or anything else like it) unless it develops a lot further and begins participating in recognized independent tests. MC - Site Manager. Well, I tried it, I'm sure it's a wonderful program, BUT, even after a careful installation, it nags the devil out of you to sign up for the stuff you didn't want. Have been using Bitdefender for a year, no problems. Before that, was using Avast, my favorite, but Avast changed something in their detection rules and it would not allow me the see my security cameras for remote sites. I have income properties in other states. So, ran a scan with the Comodo antivirus, O (zero) detection. This tells me that the Bitdefender is doing its job, and I am ALL OVER the internet. Sorry, I can't for the life of me see why anyone would rate this as their number 1 source for protection. It's intrusive, and it nags the heck out of to sign up for the add ons you didn't want in the first place. Were these messages you saw in the lower-right corner of the screen in a small popup window? If so, then I just added advice on how to disable these advertisements to the article. I apologize, I had meant to mention this previously, but forgot to include it in a previous revision. Excellent review as usual Chiron. I'd been using the free Avast AV/Comodo firewall combo for about 2 years but problems with Avast updating and your favourable Comodo AV review led me to ditch Avast and replace it with the full Comodo Internet Security free suite. Much less hassle having everything in one place and not having to worry about conflicts and creating exclusions etc. Things are now noticeably quicker. I'm happy to hear that. It's very nice that users have the choice of whether to use Comodo Firewall with Avast Free. They are a very nice combination. However, I personally also use Comodo Internet Security, and prefer it to any other combination. That said, each computer, and computer user, is different. Thus, the more top-quality options which can be presented the better. Thank you very much for letting us know that Comodo Internet Security worked very well for you. If you run into any problems, or have any questions/suggestions, please do let us know. Thanks again. One thing I didn't mention was what a nightmare it was to uninstall Comodo firewall to do a clean install of CIS Premium, even using your guide on the Comodo forums (Revo, both removal tools etc). Lost internet connection, CIS wouldn't install and restore wouldn't work due probably to either remnants of Avast or Comodo firewall. I finally got everything to work a considerable time later. Did you make sure that the firewall driver was correctly removed before rebooting into Safe Mode? Sadly sometimes that is not removed by the uninstaller, and I don't believe the removal tools correctly remove that either. Either way, it is true that Comodo Firewall doesn't always uninstall easily. However, the methods I suggested, which you followed, will allow it to nearly always uninstall correctly. It seems that you ran into some bad luck. By the way, how did you eventually get it to work? Thanks. You're right about the firewall driver. Neither removal tool nor the uninstaller removed it. Your advice to remove it manually is several steps after rebooting into safe mode, so it hadn't been removed before doing this. Regarding how I managed to get things to work, things are a little hazy due to a fair bit of red mist, but I went through the uninstall procedure again with Avast (2 removal tools like Comodo) and Comodo Firewall, still wasn't able to install CIS but at least restore then worked so as a last resort I restored to before trying to uninstall Comodo Firewall, and just went through the whole laborious process again and eventually it worked. I think perhaps I should move the advice about manually removing the firewall driver into the main advice section of my topic. Then again, it's not something which most users would like to do. I'll have to think about it some more, but your experience has given me a lot to think about. Thank you. Good Day A ! Hi George.J ! I am a current user of 360 IS and am considering switching to 360 TS for support reasons as you know. I'm curious if you could tell me more about your experience with 360 TS compared to 360 IS regarding detection rate, resource usage, boot up time, scan time, and how well 360 TS plays with other software, such as MBM and SAS. Never mind George, I have already found answers to my questions. I agree with your findings although with an i5 and 8G in my dual booted desktop I'm not too bothered about resource use for anything. Unfortunately, 360IS is being discontinued in favor of 360TS so I'd rather use something that is being fully supported. MC - Site Manager. 360IS isn't discontinued. It just had an update today :D It's just that they are concentrating more on the TS version. Not yet it's not, but their plan is for TS to replace 360IS, although they haven't said when. MC - Site Manager.